on the exterior landing gear set. Interior, Nostromo C-Deck landing gear chamber set. Landing gear is aligned with the bay door opening. Exterior, Nostromo landing gear set. Landing gear is also aligned with bay doors. 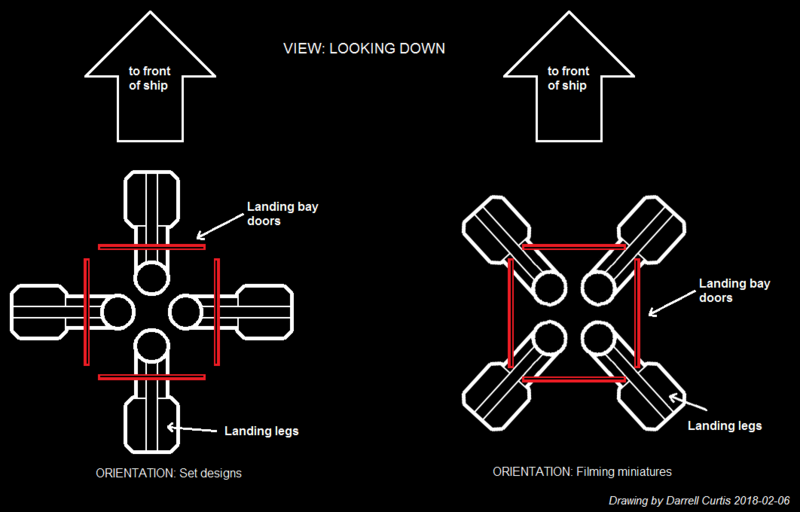 Adam’s drawing of the landing gear and its doors at center left. His reproductions of these (and other) set plans show just how clever were the folks who brought this film to life. The forward landing gear is rotated 45 degrees. The same configuration is seen on the aft landing gear. Another good shot of the front landing gear orientation. Comparison drawing, showing the two orientations discussed, and how they relate to the direction of the ship. Part of the “fun” of imagining blueprints and deckplans (even a tech manual?) is finding a workable solution that isn’t restricted by present-day technology but isn’t too Whovian either. Sometimes simplicity is the key, eh? And in the end, regardless of whether or not the Nostromo crosses her legs in proper fashion when she lands, she’ll always be a lady to me. Previous The Andy Rowlands Nostromo Set Plan Models.